Coady Supple, based in central London, is an independent partnership which brings together two of the leading shopping centre investment specialists in the commercial property market. The practice is unique. It was the first to specialise solely in the dynamic and complex world of shopping centre investment. It combines the extensive experience and in depth knowledge of the market of the founding partners together with specialist in house analytical skills. 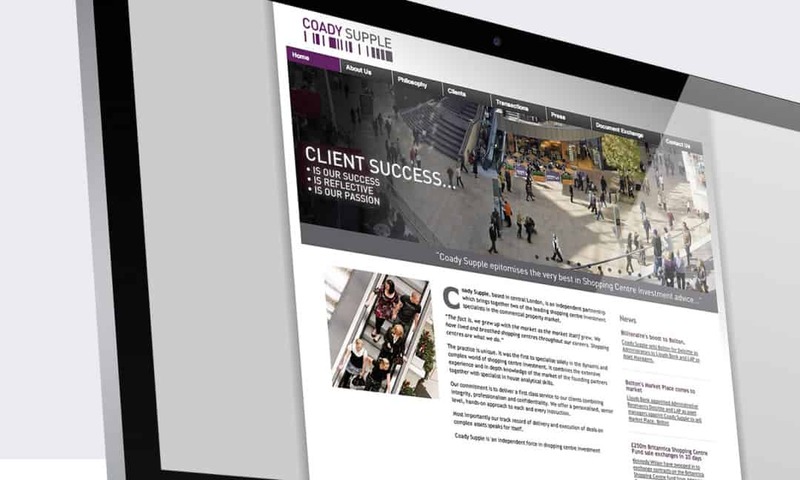 We were exclusively appointed by London based shopping centre investment specialists Coady Supple as they required a new corporate website designing and developing. It was important to them that the new site showcased their portfolio of retail instructions. The new site our team created included all the key elements that you would expect an interactive website to offer, including a fully accessible CMS system and a bespoke file sharing facility which enables Coady Supple to upload and share files with desired individuals.